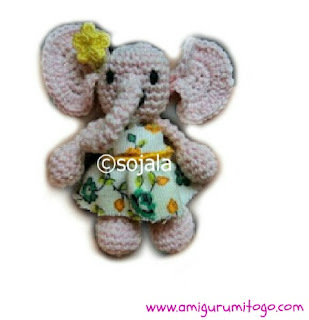 Gracie the Tiny Elephant the sweetest little thing made with crochet thread. She's a tiny version of my larger elephant pattern found here. with some experience working with crochet thread and with amigurumi. I hope you enjoy the pattern as it is. Thank you! You can now scroll down this page to the pattern. 11) sl st into next st and finish off. Leave long tail for sewing. bring tail through and weave in and out along the length of the trunk then pull until you have the shape you want for the trunk. Knot off the end to hold shape. 2) sl st into next st and finish off. This is optional. You can sew the trunk as is to the face but I made a little base for the end of the trunk which I sewed on the base of the trunk then sewed the entire thing to the face. I found it looked better with the base on it. I show how to do the ears in a video tutorial for a larger, different colored elephant. But I'll try to explain here. (If you still have troubles watch this video and fast forward to 5:15) Take the open ends of the ear (half circle) and point the ends away from the front side of the ear. Sew the edges of those ends together. Thread the tail of the yarn from the middle of the ear and out through the side and pull. This will shrink up the ear and give it some shape. Continue to shape ear until you are happy with it. Sew edge piece that you just sewed together to the head. Use a long pin to hold it in place while you get a couple stitches in. See pictures below. Now you can add in a mouth if you want. I used black embroidery thread for mine and went in through the back of the head and out through front, created the mouth and brought the thread back out through the same hole in the back of the head, knotted the ends off and hid the knot in the back of the head. I found my tiny elephant was in need of a dress but I'm no seamstress so decided just to wing it with some scrap fabric. I cut a piece as pictured and then folded the fabric to get a clean edge. I weaved sewing thread in and out, close together along the top edge of the fold. I then slid the fabric down towards one end of the thread until I got a nice pleated look... this ended up being the bottom part of the dress and I sewed it right to the body of the elephant. I did something similar for the top part. I added gold string around the middle to finish off the look. It ended up looking pretty good and my daughter *Gracie* LOVES her tiny elephant and the tiny dress! What a nice little cutie. This is a test.it is only a test. If it works will be followed by a real comment. So glad to see you and hopefully the laptap bugs get worked out and you can comment freely. Thanks so much for trying and trying again! LOL! Finally!! I really hated biting my tongue because I couldn't comment!! Now I feel freeeeee!! But I will try really hard not to be too chatty and use up all the comment space! Haha! She is delightful, I have got to make her for my grandaughter, she will be tickled pink. Thanks so much Fiddly Fingers and you're very welcome! So happy you found your way here... good luck at your craft sales, sounds like fun! Hello - I would love to try my hand at creating one of these adoreable elephants, but not able to do a copy/paste of the pattern. When I printed the pattern it was too dark to read, and same with converting to a pdf. Any way to download this pattern? I love your amigurumis and your patterns!!! Ooooooooo. Such a sweet tiny elephant. Thank you for Gracie. My granddaughter will be thrilled. Does anyone have one of these they have made and would like to sell. Don't think I have time to learn to do this but would love to purchase one from someone for my grand daughter. If anyone has one would you please let me know. Thanks so much. Looks like so much fun to make. Thanks. Hello! Gracie is so cute! I was wondering if other Gracies made from your pattern could be sold (just the item - not the pattern). Enjoyed making a little elephant for my own daughter Gracie! I used crochet thread and a #4 hook. She was about 4 inches high and took about 30 to 35 yards of thread (rough estimate!). I think I'll make another with an even smaller hook! Is there any way to make this larger? I know someone who has a large collection of elephants and I would like to make this much larger. Thank you very much for any suggestions you may have!! this is the tiny version of my Little Bigfoot Elephant. That is only about 6 inches tall though so maybe too small still. Have a look on the right hand side of this page, scroll up and click on the label "Elephant"
its cute. i will surely make one n keep it with my purse. bec we worship elephant god every morning n start every work with uttering his name. it is perfect for me. i will give some as gifts to friends too. Sharon, I tooo came herd. Searching for cow pattern and accidentally saw this. Thankyou so much. With in a couple of week, our festival ganedh chaturdhi is there...God with elephant head and on that occasion, Gracie is chief guest. I silll make this surely. Thank you, thank you, thank you! My granny loves elephants and this is perfect for her birthday present - she's turning 101! Plus she taught me to crochet. Again thank you for the pattern it is very appreciated.